Not to be confused with Coast Guard Island. 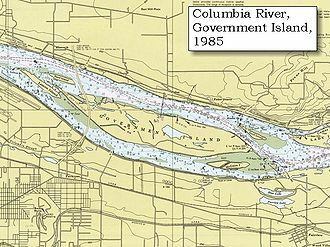 Government Island is a 1,760-acre (710 ha) island in the Columbia River north of Portland, in Multnomah County, in the U.S. state of Oregon. 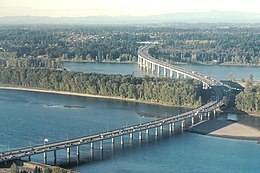 Though Interstate 205 passes over it on the Glenn L. Jackson Memorial Bridge, access to the island is only by boat. There is a city controlled locked gate in the 205 fence. The Government Island State Recreation Area includes 15 miles of shoreline, with two docks on the northern side of the island. The interior of the island is accessible only by permit and contains protected natural areas, such as Jewit Lake. Camping is permitted below the vegetation line around the perimeter of the island. Picnic tables and restrooms can be found in these areas as well. Government Island is home to a variety of animals, notably a great blue heron colony that has been on the island for at least a decade. Many threatened or endangered wildlife species live on the island, including red-legged frog, pileated woodpecker, little willow flycatcher, olive-sided flycatcher, western meadowlark, horned grebe, red-necked grebe, bufflehead, purple martin, and possibly the endangered Columbian white-tailed deer. Government Island’s first documented visitors were British explorer William Robert Broughton in 1792 and American explorers Lewis and Clark in 1805. The island acquired its current name after being appropriated by the U.S. military in 1850 to grow hay. An old barn and other structures can be found on the interior of the island from when it was privately owned and settled by a small number of families. Most of the island is owned by the Port of Portland. The Port acquired the entire island, along with the adjacent Lemon Island (45°35′33″N 122°34′00″W﻿ / ﻿45.5926183°N 122.5667612°W﻿ / 45.5926183; -122.5667612) and McGuire Island (45°33′49″N 122°27′54″W﻿ / ﻿45.5637302°N 122.4650921°W﻿ / 45.5637302; -122.4650921), in 1969 in order to expand nearby Portland International Airport. Though those plans have been abandoned, the Port continues to control the land to prevent any uses incompatible with its location under the airport's primary flight path. In 1999 the Port sold 224 acres (91 ha) of the island to Metro, a regional government agency, and leased the remainder to the Oregon Parks and Recreation Department for 99 years. In July 2014, three people were stabbed on Lemon Island during a party of several hundred people that was hosted there without a permit from Oregon Parks & Recreation. ^ "Government Island State Recreation Area". Oregon State Parks and Recreaction. Retrieved 2018-06-30. ^ "Government Island". Audubon Society of Portland. Retrieved 2018-06-30. ^ Lewis A. McArthur; Lewis L. McArthur (2003) . Oregon Geographic Names (7th ed.). Oregon Historical Society Press. p. 927. ISBN 0-87595-278-X. ^ "History/FAQ - Government Island State Recreation Area". Oregon State Parks and Recreation. Retrieved 2018-06-30. ^ Scott Hewitt (September 1, 2010). "What's Up with That? Government Island gets human visitors, but no cows". The Columbian. Retrieved 2019-02-25. ^ "Government Island Management Plan" (PDF). Port of Portland. March 7, 2002. Archived (PDF) from the original on 2018-06-30. ^ Sara DiNatale (July 12, 2014). "Huge dance party on Columbia River island was unsanctioned but accepted by law enforcement, parks officials". OregonLive. Retrieved 2019-02-25. ^ Kasia Hall (August 28, 2014). "Multnomah County Sheriff's Office outlines enforcement guidelines for Columbia River islands after recent violence". Oregonlive.com. Retrieved 2016-11-12. This page was last edited on 7 April 2019, at 23:33 (UTC).